Revolution is a lively bar located in the heart of Birmingham's Broad Street district. Here you can chill out with one of their massive range of vodkas, from a parma violet flavoured shot to a cool vodka cocktail. Do you work at Revolution? What did you think of Revolution? This is the best bar in the city. No shadow of a doubt. The shots are lethal and the food is well priced and tasty! Like vodka? You will love Revolution. Cocktails and shots aplenty, this spirits-inspired bar will keep you coming back for more. If you walk from the Five Ways end of Broad Street, Revolution is the first bar you come to on the right hand side. Inside the layout is fantastic: a large bar stretches down the right from the main entrance, almost the entire length of the venue, with intimate booths down the opposite side for couples to be alone or smaller groups to secure a bit more privacy from the passing crowds. At the bottom of the venue is a small but decent enough dance floor for people to show their stuff and there’s more seating at the back. There is an upstairs but this is normally reserved for private parties, you aren’t missing out on anything, it only consists of more tables and chairs. Decor-wise Revolution comes into its own. Classy contemporary lighting and mirrored walls set the ambience. The furniture follows suit with dark rich colours and snazzy designs, it almost feels more like a swanky jazz club but doesn’t cross into that self indulgent zone that so many do. The people that visit Revolution are normally more exciting than your average Joe wanting a pint. The great cocktails and shots give more choice than your normal bar. Staff are quick to serve people and do all of the drinks free pouring right in front of you which is reassuring and quite entertaining. It’s done with a smile and they seem to enjoy the job. The atmosphere is relaxed and the layout means it feels very sociable. Vodka is the theme here and it’s well represented with bottles adorning the walls behind the bar. The cocktail menu is immense with unique variations such as Russian Bride (a twist on the famous White Russian), or a Delboy consisting of pineapple juice, Blue Curacao and coconut. Also on offer is a large selection of vodka shot flavours from the normal orange or cherry to the sickly sounding porridge! Although the bar is vodka inspired there are draught beers on offer such as Stella or more unusually Boddingtons. There is a great choice of familiar European bottled beers. You should only be drinking one thing here though: vodka. Its great quality stuff and at £4.70 for a double on a Friday night it won’t break the bank. Revolution’s food combines decent pub grub like steaks, burgers and wraps with more restaurant-style cuisine. There is a promise of a free meal if it isn’t delivered within 15 minutes, a pledge that’s undoubtedly popular with the local business community. Revolution is one of the premier bars on Broad Street. The atmosphere, drinks and decor set it aside from its competitors. 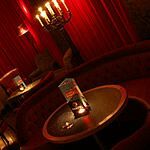 You can spend all night in the venue or simply pop in for a cocktail, its beauty lies in the relaxed atmosphere. If you are yet to sample a night at Revolution, put this at the top of your list for a night out!